LIQUID appears or vanishes at your will! AUTO RESET. You are going to love discovering the secret of our NEW DELUXE DISAPPEARING MILK GLASS. Simple yet so clever! Our version uses a unique method that allows you to control the rate of increase or decrease of liquid in the glass! What is a locking milk glass, you ask? Well most have seen a magician pour milk in a cone only to have it vanish. Now you can do that and SO MUCH MORE!! The natural look of this prop will fit any style and show. OR take the classic vanishing milk pitcher effect to the next level. Pour milk from the glass in to a paper cone. The audience see the milk draining from the glass. With our milk glass not only can you make the milk vanish BUT NOW YOU CAN MAKE THE MILK APPEAR BACK IN THE GLASS! No milk pitcher does that! Just cover the glass for a second and the milk is back! One magician we know just spins around and by the time he has returned to front the once empty glass is full again! SPECTACULAR! OR how about a version of the "ghost glass" ? Place a straw in the glass. The audience sees a ghost drinking the milk as they see the milk go down as if something was actually drinking from the straw. The bonus is that ghosts do not have stomachs so the milk reappears back in the glass! FULL SIZE 8 oz. tumbler made in durable plastic for a long life and easy clean up! Unique locking mechanism allows you to leave the full glass on the table before and after the effect. Liquid is under YOUR CONTROL and can vanish or appear at the pace that suits your needs. You can drink from the glass. It is not sealed and you can put many other drinks of your choosing. When in the drained state, only 1" liquid remains. Yet it will magically refill to the full 8 oz! Check out our Magic Concentrated Milk on this page. No longer worry about having to carry milk around and it souring or wasting it - and it's inexpensive to use! An absolute classic of magic. Every magician should own this. You show a white ball resting on a stand. You hold the ends of a cloth and bring it in front of the ball. Slowly & incredibly the ball rises, taking the cloth along for the ride, it rises up higher and higher. The ball floats so high you have to stand on your toes to bring it down! You can do this as much as you want, the ball is under your control 100% of the time. The ball then peeks over the cloth and then back down under it again - as if it has a life of it's own. Lastly, the ball floats around some more until finally coming to rest on it's stand. Complete with everything ... instructions, white styro ball, cloth, stand & gimmick. Because this is a lighter weight ball than the aluminum silver version, it is much easier to master. See this page for our shiny, polished aluminum stage version. OUR ZOMBIE is the first floating ball with BRILLIANT LED lights! Only ONE more in stock - after that, no longer available. HIGHLY RECOMMENDED - EASY TO DO! IT'S OUT OF THIS WORLD! This specially designed version is perfect for stage, larger venues or just your own living room. A large glittering ball, with 12 brilliant blue lights throughout its body floats on a cloth up and down. Positively the most amazing magic effect of it's kind! EFFECT: You tell a story that your eerie looking brilliant ball is actually a Zombie trapped in the shape of a sphere. The only way to control it is with the cloth you hold. The ball is seen resting on the stand. You hold the two ends of the cloth & bring it in front of the ball. Slowly & unbelievably the form of the ball rises, taking the cloth with it - it rises up & up until it is clear of the table. It floats so high you have to stand on your toes to bring it down! You can do this as many times as desired since it's fully under your control. It then peeks over the top of the cloth, then down again, finally coming to rest on its stand. So easy to do, but fascinating to watch. You will even enjoy doing it in front of the mirror. No threads or assistants needed! BONUS: We include our DELUXE ZOMBIE CLOTH with fringe - a $39.95 value, FREE with this set! We have the LOWEST PRICE on this item! BLOW YOUR FRIENDS AWAY WHEN YOU MAKE YOUR SODA FLOAT IN MID AIR! You casually pick up a glass & start pouring soda into it. What? You forgot something? Have to look at your watch? Just let go of the glass & it remains SUSPENDED in mid-air! 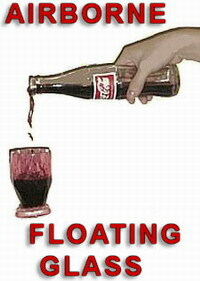 The glass of soda continues to float while still pouring from the bottle! At any point stop & place the glass on the table. A very stunningly visual, but extremely easy to do trick. We supply the prop & the glass, use any standard Plastic (PET) Soda Bottle with screw-on cap which any audience would be familiar with. The prop fits into any standard plastic (PET) soft drink bottle. This product is suitable only for adult performers, but gets a wonderful reaction when performing for both adults & children! Comes ready to use with special gimmick & glass. You can use this with any size PLASTIC soda bottle. Although the bottles vary considerably in size, the mouth & cap size of all these soda bottles is the same. This is not a close-up trick & should be performed at least 8-10 feet away with your audience sitting down. Airborne Glass was created by John Fabjance. It has been performed by such notable magicians as Blackstone, Harry Anderson, and Lance Burton. A mind boggling experiment of mind over matter! You place a small ball on a transparent base, and walk away from the table. A spectator is invited to place a large glass over both the ball and base to show that there truly isn't anything attached to either the ball or the base. Then, as you concentrate on the ball, it'll take a life of its own and roll off the base onto the table! The glass can then be removed and everything examined. Demonstrate your PSI powers using this trick! No wires, threads or magnets! The ball can roll off the base onto a spectator's selected card! Ball can be covered with inverted glass! Walk far away - and you can still do it! You'll knock 'em dead! 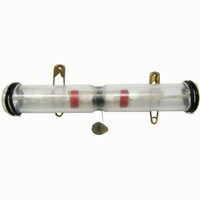 You simply display a small corked test tube & inside clearly rests a small silvery bar. Holding the tube at your index finger tips, you cause the rod to bob restlessly in the vial. Hmmmm! Suddenly, the bar actually pushes the cork up out of the tube. Then hops out of the vial & into your hand as it proceeds to wiggle around! Now it dances around then floats up & into the air, hopping around in the space between your hands. It bobs around & flies from one hand to the other! You can pass a ring over the bar in mid-air! Everything you need is included with detailed instructions. This is a sensational trick! SPECIAL: BUY 2 AND RECEIVE A 3RD FREE! EFFECT: You display a metal nut and bolt, which can be examined by the audience. A friend then threads the bolt through the nut, which may be placed on your spectator's hand or table top & inside or outside the isolation case. At your command, the bolt VISIBLY & mysteriously spins and un-threads itself from the nut! Any audience member stares into your wrist watch - and names the card that someone else has selected! Card watches have been unavailable for many, many years. That's a shame, because this has always been one of my favorite tricks! And our new design is nicer than any other card watch I've ever seen. Most have been cheap watches gimmicked to work. Ours is made specially for this effect, and comes with a BEAUTIFULLY ELEGANT STAINLESS STEEL MESH BAND! So besides a wonderful trick, you receive a beautiful watch that you can wear - ready to blow your friends away at a moment's notice! Here's the effect: You borrow a deck (or can use your own). You have your friend select a card. You tell your friend that the crystal in your watch works like a crystal ball. He is instructed to gaze into the crystal of your watch. He will not believe it, as a picture of the card he selected card appears in the watch! Then, it mysteriously fades away and the watch face returns to black. Image this - IF YOU WANT, you can have ANY other friend or audience member stare into the watch, and they will NAME the card that your other friend selected! Our watch is made to sell for $100.00. We made a large purchase - & while our first shipment lasts, you can purchase one for only $49.95! SAVE $50.05. EXTREMELY EASY to perform. Very spooky & a very strong magic effect. 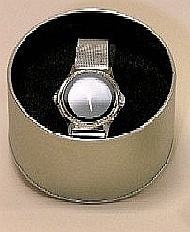 Adult size band (you can use the watch with your own band if desired). Use any deck. Packed in a beautiful silver colored metal display box.